With 20 horses running farther than they ever have, the Kentucky Derby continues to produce outstanding payoffs, and the 2018 Kentucky Derby figures to be no exception. Part of the reason the Kentucky Derby Exacta, Trifecta and Superfecta are so hard to hit is the sheer number of combinations with 20 horses in the race. See how the possible combinations jump considerably with every additional horse, or going up a level in difficulty of the wager. 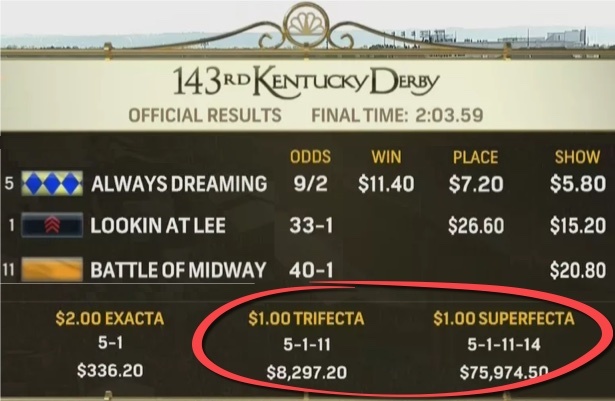 In 2017, even with the favorite Always Dreaming winning, the $1 Trifecta payout exceeded the average payout based on the number of combinations. 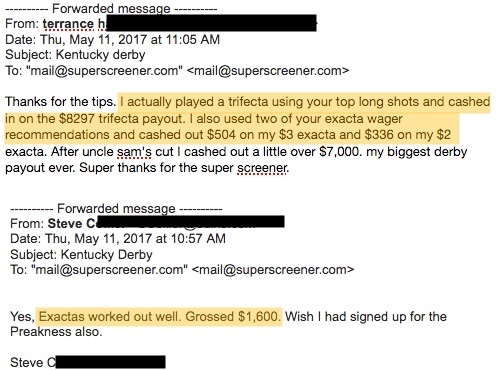 The Superfecta payout was technically “easier” than average, but only slightly with the Superfecta returning a whopping $75,000+ for a $1 combination. So, what is the key to big payouts? Find the right longshot. Given that you can have huge payouts even with the favorite winning — and the favorite has won an incredible five years in a row — the key to big payouts come down to finding the right high-priced runner. 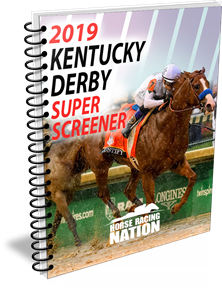 This is where the Kentucky Derby Super Screener handicapping system pays real dividends, as it has excelled in finding the right longshots to key with amazing precision. 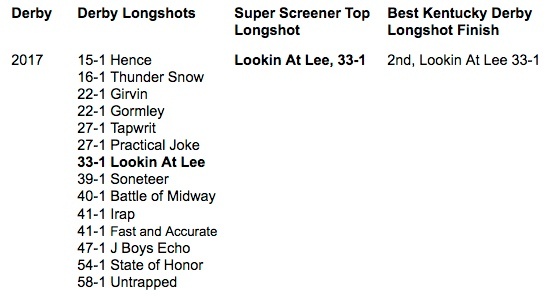 In 2017, the Super Screener was able to key in on Lookin At Lee as the best longshot out of 14 horses going off of odds between 15-1 and 58-1. At 33-1, Lookin At Lee was the key to the big Exacta, Trifecta and Superfecta payouts. Will Derby pay big again in 2018? 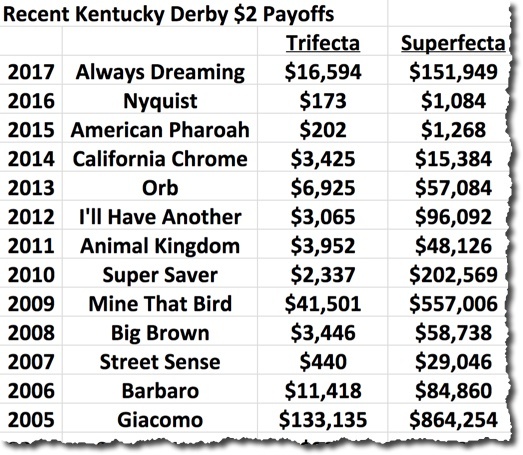 Looking at recent Kentucky Derby payouts, the Trifecta has generated large payouts (greater than $2,000) in 10 of the last 13 years, and the Superfecta has generated huge payouts (greater than $15,000) in 11 of the past 13 years. The odds of a big payout in 2018 are high due to a couple key factors. First, as we noted earlier, with 20 horses, the sheer number of combinations make the Trifecta and Superfecta extremely difficult to hit, especially without the right system. 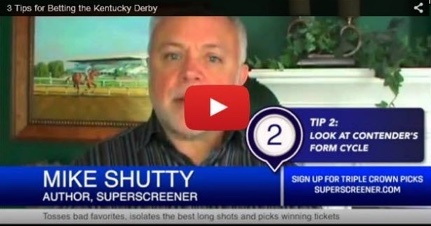 Watch Now – 3 Must-Know Kentucky Derby Tips! Secondly, the 2018 Kentucky Derby field, while having a clear favorite with Justify, is one of the most difficult in recent memory with many experts calling it the deepest Derby field in years due to as many as seven top win contenders. Mendelssohn (6-1) won the UAE Derby by a staggering 18 1/2 lengths. Magnum Moon (8-1) is an undefeated Pletcher trainee. Good Magic (8-1) is the juvenile champ. Bolt d’Oro (10) has won multiple Grade 1 races. Audible (10-1) is unbeaten for Pletcher at age 3. Vino Rosso (15-1) is another major prep winner for Pletcher. All of these contenders have top credentials, and every one of these contenders is a big threat to finish second and a threat for the win depending on how much you like them and Justify. So it’s not possible (without running out of money) to focus on seven top contenders that could win the race, or even seven top contenders that can run second, without separating the 20 horses that could run third. After the top seven contenders, this leaves a whopping 13 longshots to choose from — and you can’t include them all, maybe two or three at most. So again, the key is finding the right longshots to use. While there were no longshots on the board in 2016 or 2015, that has been an extremely rare occurrence in the past 17 years. 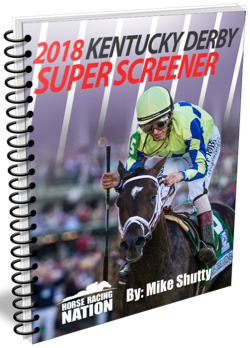 The favorite + longshot formula worked very well in 2014, when California Chrome won the Derby as the 5-2 favorite, but the Super Screener tabbed 37-1 Commanding Curve as the top longshot bomber. 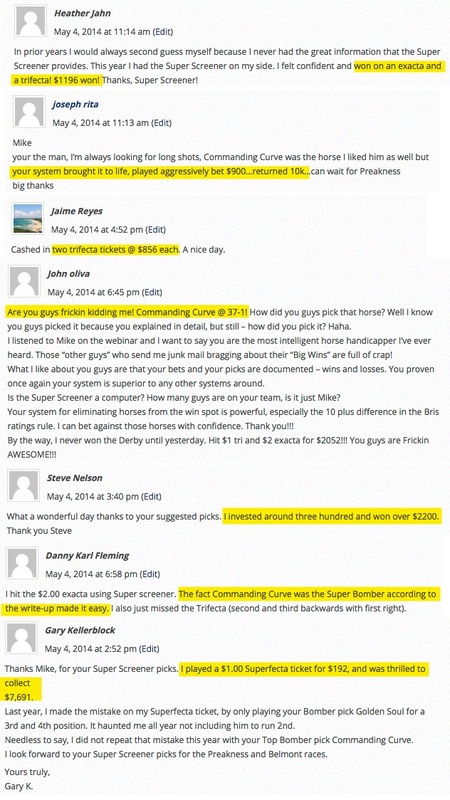 Once again, sorting out and finding Commanding Curve at 37-1 as the top longshot out of 14 longshots between 16-1 and 49-1 was the key to scoring big on the Derby. 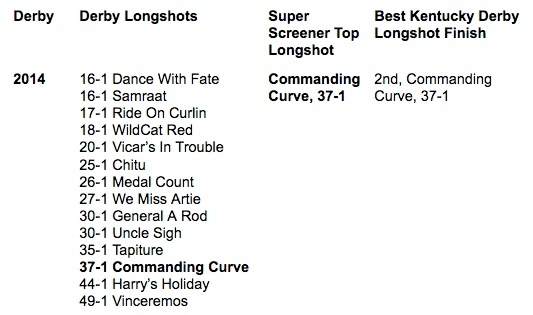 The Super Screener system found the qualities that made Commanding Curve stand out from the others. Super Screener readers were once again rewarded with some very big payoffs. In 2013, it was a more open Derby with Orb as lukewarm 5-1 favorite along with top contenders Revolutionary (6-1), Goldencents (7-1), Verrazano (9-1), Normandy Invasion (9-1) and Itsmyluckyday (9-1). That presented six top contenders under 10-1 odds, but ultimately it was the favorite, Orb, who prevailed in the mud. But what blew up the prices again was a longshot, as Golden Soul splashed home in second at 34-1 to blow up the exacta, trifecta and superfecta payoffs. 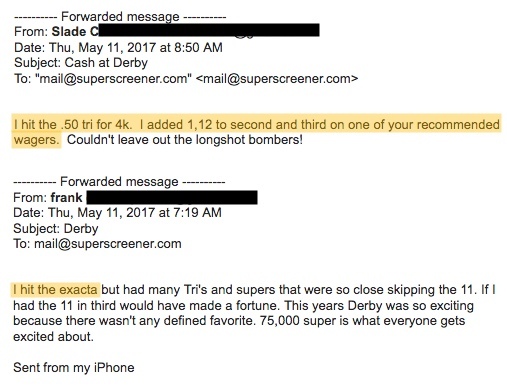 You guessed it: Golden Soul was the Super Screener top longshot bomber, and he keyed some very big payoffs for Super Screener readers.